What’s not to like about the Franc? It boasts a strong economy, low inflation, and low unemployment. Unlike the US and Japan, Switzerland is not plagued by a high national debt and perennial budget deficits. Its monetary policy has been extremely conservative: no quantitative easing, asset-purchases, or any other money printing programs with euphemistic names. Given that Swiss exports have surged in spite of (or even because of) the rising Franc, however, he has very little to worry about at the moment. 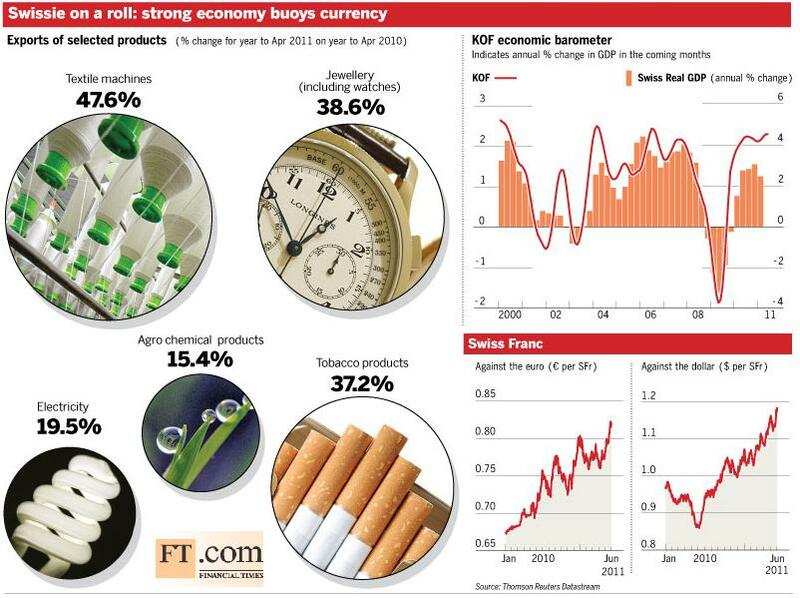 As you can see fromt he graphic below (courtesy of the Financial Times), the balance of trade continues to expand, and has exploded in a handful of key sectors. To be sure, economists expect that this situation will eventually correct itself and are already moving to revise downward 2011 and 2012 GDP growth estimates. Then again, they made the same erroneous predictions in 2010. The main variable in the Swiss Franc is the Swiss National Bank (SNB). 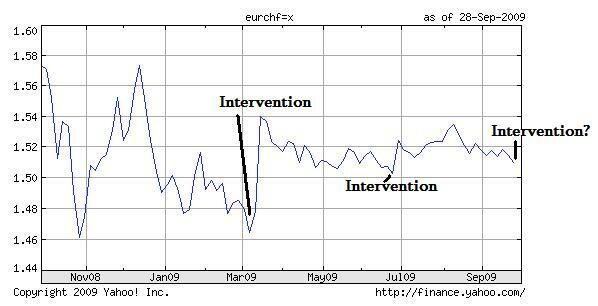 Having booked a loss of CHF 20 Billion from failed intervention in 2010, the SNB is not in a position to make the same mistake again. In fact, SNB President Philipp Hildebrand has not even stooped to verbal intervention this time around, undoubtedly cognizant of the fact that he has very little credibility in forex markets. At the same time, the SNB is not in any hurry to raise interest rates, lest it stoke further speculative interest in the Franc. Its June meeting came and went without any indication of when it might tighten. 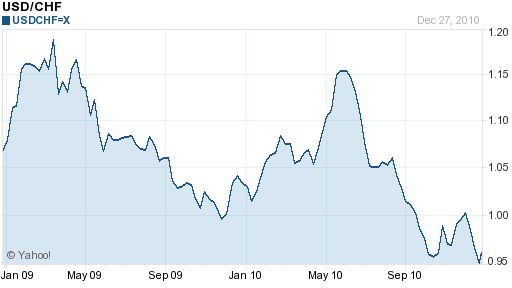 Interest rate futures currently reflect an expectation that the first rate hike won’t come until March 2012. Thus, the downside of holding the Franc is that it will continue to pay a negative real interest rate. The only upside, then, is the possibility of further appreciation. Fortunately, the SNB is unlikely to stop the Franc from rising, since it serves the same monetary end as higher interest rates. In other words, a more valuable Franc serves as a direct check on inflation because it lowers the cost of commodity imports and should (eventually) soften demand for Swiss exports. It is possible that the Swiss Franc will suffer a correction at some point, if only because it rose by such a large margin in such a short period of time. On the other hand, given that its economy has proved its ability to withstand the Franc’s appreciation, it’s no wonder that investors continue to bet on its rise. Last week, the Wall Street Journal published an article entitled, “Currency Correlations Lose Their Way for Now.” My response: It depends on which currencies you’re looking at. I, too, recently posted about the break-down of multi-year correlations, specifically involving the Australian Dollar and the New Zealand Dollar. However, one has to look no further than the Swiss Franc to see that in fact currency correlations are not only extant, but flourishing! I stumbled upon this correlation inadvertently, with the intention (call it a twisted hobby…) of refuting the crux of the WSJ article, which is that “Standard relationships between risk appetite and safe havens, and yields and risky assets, are lost as investors appear to scramble in their efforts to adapt to a new direction.” Basically, the author asserted that forex traders are searching for guidance amidst conflicting signals, but this has caused the three traditional safe haven currencies to behave erratically: apparently, the Franc has soared, the Yen has crashed, and the US Dollar has stagnated. I pulled up a one-year chart of the CHFUSD and the CHFJPY in order to confirm that this was indeed the case. As you can see from the chart above, it most certainly is not. With scant exception, the Swiss Franc’s rise against both the US Dollar and the Japanese Yen has been both consistent and dependable. The only reason that there is any gap between the two pairs is because the Yen has outperformed the dollar over the same time period. If you shorten the time frame to six months or less, the two pairs come very close to complete convergence. 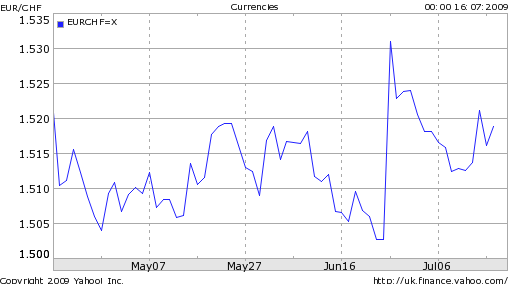 In order to provide more support for this observation, I turned to the currency correlations page of Mataf.net (the founder of which I interviewed only last month). Sure enough, there is a current weekly correlation of 93% [it is displayed as negative below because of the way the currencies are ordered] between the CHFUSD and the CHFJPY, which is to say that the two are almost perfectly correlated. (Incidentally, the correlation coefficient between the USDCHF and the USDJPY is a solid 81%, which shows that relative to the Dollar, the Yen and Franc are highly correlated). Moreover, if Mataf.net offered correlation data based on monthly fluctuations, my guess it that the correlations would be even tighter. In any event, you can see from the chart that even the weekly correlation has been quite strong for most of the weeks over the last year. The first question most traders will invariably ask is, “Why is this the case?” What is causing this correlation? In a nutshell, the answer is that the WSJ is wrong. As I wrote last month, the safe haven trade is alive and well. Otherwise, why would two currencies as disparate as the Franc and the Yen (whose economic, fiscal, and monetary situations couldn’t be more different) be moving in tandem? The fact that they are highly correlated shows that regardless of whether they are rising or falling is less noteworthy than the fact that they tend to rise and fall together. Generally speaking, when there is aversion to risk, both rise. When there is appetite for risk, they both fall. The superseding question is, “What should I do with this information?” Here’s an idea: how about using this correlation for diversification purposes? In other words, if you were to make a bet on risk aversion, for example, why not sell both the USDJPY as well as the USDCHF? In this way, you can trade this idea without putting all of your eggs in one basket. If risk aversion picks up, but Japan defaults on its debt (an extreme possibility, but you see my point), you would certainly do better than if you had only sold the USDJPY. The same goes for making a bet on the Franc. Whether you believe it will continue rising or instead suffer a correction, you can limit your exposure to counter currency (i.e. 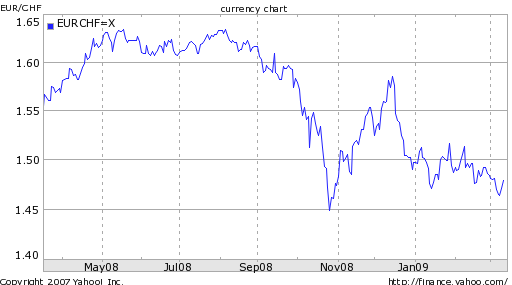 the dollar and yen) risk by trading two (or more) correlated pairs simultaneously. In the end, just knowing that the correlation exists is often enough because of what it tells you about the mindset of investors. In this case, it is just more proof that they remain heavily fixated on the idea of risk. Has the Swiss Franc Reached its Limit? The second half of 2010 witnessed a 20% rise in the Swiss Franc (against the US Dollar), which experienced an upswing more closely associated with equities than with currencies. It has managed to entrench itself well above parity with the Dollar, and has become a favored destination for investors looking for a safer alternative to the Euro. Still, there are reasons to wary, and it could be only a matter of time before the CHF bull market comes to a screeching halt. The forces behind the Franc’s rise are easily identifiable. It basically comes down to risk aversion. While it can’t compete with the Dollar and Yen – its main safe haven rivals – in size and liquidity, it benefits from its perceived economic and fiscal stability, as well as through contradistinction with the surrounding Eurozone. 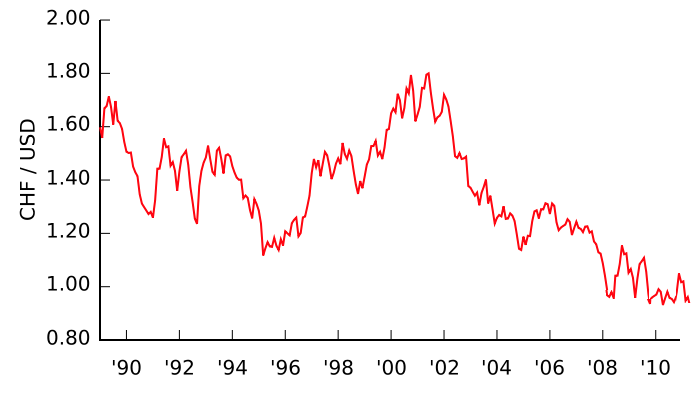 In fact, the Franc’s rise against the Euro has been even steeper than its rise against the Dollar. As the Eurozone crisis radiates further away from Greece, Switzerland has come to seem more like an island in a sea of chaos. Even an abatement in the EU storm has failed to produce a Swiss Franc correction. That could be because the bad news coming out of Europe seems to be never-ending; one country’s rescue is followed by the downgrade of another country’s sovereign credit rating and warning of imminent collapse. In addition, even as investors have embraced risk-taking, they still remain prone to sudden backtracking. 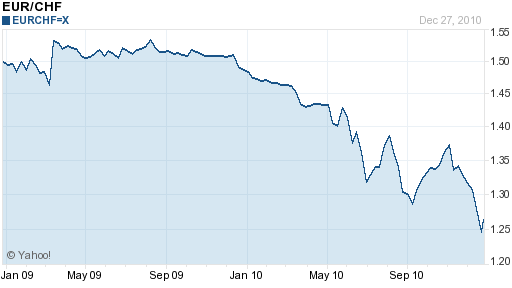 Thus, the Franc has been one of the primary targets of risk-averse capital fleeing the Egyptian political turmoil. Capital controls and intervention have scared investors away from some currencies, but the Swiss National Bank (SNB) lacks the credibility afforded to other Central Banks. The SNB lost $25 Billion in 2010 in a vain effort to hold down the Franc, and currency investors believe that it has neither the stomach nor the mandate to engage in a similar loss-making campaign in 2011. Besides, the Swiss economy has held up remarkably well, and the trade surplus has actually widened in the face of currency appreciation. The markets might be keen to test the limits of the Swiss export sector, in much the same way that they have challenged Japan by pushing up the Yen. Still, their are limits to high the Franc can rise, and it appears that I’m no longer the only analyst who thinks it’s undervalued. Don’t forget- the Swiss economy is comparatively minuscule. Its capital markets can absorb only a small fraction of the inflows that the US and Japan can handle, and the Swiss Franc represents a mere 3.5% of all foreign exchange volume, 12 times less than the US Dollar’s share. In other words, it’s only a matter of time before investors run out of Swiss assets to buy, at which point they will have to decide whether to accept short-term returns of 0% in exchange for capital preservation and financial security. My bet is that they’ll walk. In the last two weeks, the Swiss Franc rose to record highs against not one, not two, but three major currencies: the US Dollar, Euro, and British Pound. The Franc is now entrenched well above parity against the Dollar, and is closing in on the magical level of 1:1 against the Euro. 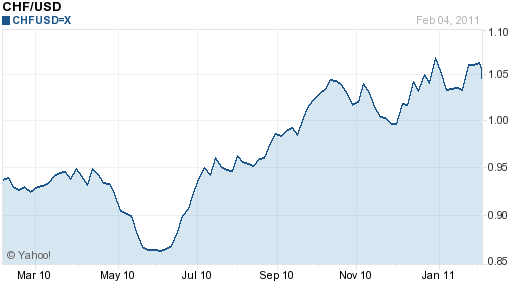 With market uncertainty projected to run well into 2011, continued strength in the Franc is all but assured. The Franc’s rise is due entirely to its being perceived as a safe haven currency. Its debt levels are comparable to other industrialized countries, its economy is in mediocre shape, and interest rates are the lowest in the entire world (the overnight lending rate is a paltry .1%). Some analysts have cited the “strong Swiss economic outlook” and “the health of Swiss public finances” as two factors buttressing its strength, but make not mistake: if not for the tide of risk aversion sweeping through the world’s financial markets, the Franc would hardly be attracting any attention. As I have reported recently, the Dollar and the Yen have also benefited from the spike of risk aversion caused by renewed concerns over the fiscal health of the EU and the prospect of conflict in Korea. Perhaps owning to nothing more than proximity, the Franc has been the primary beneficiary from EU sovereign debt crisis. “It appears that smart money investors are pre-emptively bailing funds out of the eurozone with Switzerland providing a safe port to ride out the eurozone sovereign debt storm that appears to loom on the horizon,” summarized one analyst. Unfortunately, it looks like the situation in the EU can only become serious. Despite a collective move towards fiscal austerity, all of the problem countries are still running budget deficits. As a result, members of the EU are set to issue no less than €500 Billion of new debt in 2011. To make matters worse, “The onslaught of credit warnings and downgrades of sovereign ratings over the past few days added to worries that borrowing costs in many euro zone nations could rise further.” This could trigger a self-fulfilling descent towards default and further buoy the Franc. As far as I can tell, the notion that, “Despite the Swiss franc’s recent sharp gains, we still believe there is plenty of room for further upside ahead,” seems to encapsulate current market sentiment. According to the most recent Commitment of Traders Report, investors continue to increase their long positions in the Franc. According to Bloomberg News, “Options traders are more bullish on the franc for the next three months than any major currency except the yen.” Meanwhile, a sample of analysts’ forecasts suggests that the Franc could appreciate another 5% over the next six months. As to whether intervention is likely, analysts remain divided. “The timing [for intervention] would certainly be perfect, with liquidity very thin….pre-holiday markets are ideal for springing a surprise,” said one strategist. According to Morgan Stanley, however, the SNB is “unlikely to intervene in the near term to stem the rise in the franc. The previous intervention earlier this year has left a huge overhang of liquidity in the economy and the Swiss National Bank doesn’t want to further boost the money supply.” In addition, the SNB experienced losses of €22 Billion on its forex reserves in the first nine months of this year, and will be reluctant to incur further losses by resuming intervention. In short, aside from this lone point of uncertainty, all factors point to continued upside. In the year-to-date, the Swiss Franc has risen 3% against the Dollar, 15% against the Euro, and more than 5% on a trade-weighted basis. 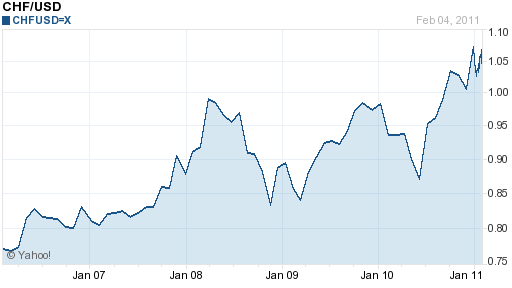 It recently touched a record low against the Euro, and is closing in on parity with the USD. Since the beginning of the summer, the Franc has rallied by an unbelievable 15% against the Greenback. I don’t think I’m alone in scratching my head in bewilderment wondering, What could possibly be behind the Franc’s rise? By this point, everyone is familiar with the safe-haven phenomenon. Basically, concerns of a double-dip recession have ignited a flare-up in risk aversion and spurred investors to shift capital into locales and investment vehicles that are perceived as less risky. Switzerland and by extension the Swiss Franc, have both benefited from this phenomenon: “Anxious investors searching for a haven from fears about the health of Europe’s banks, which knocked equities and sent peripheral eurozone government bond spreads higher, dumped the single currency. 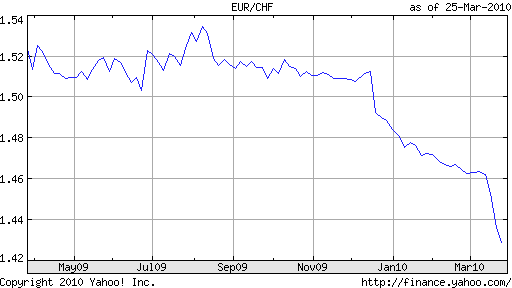 The Swiss franc benefited.” Enough said. 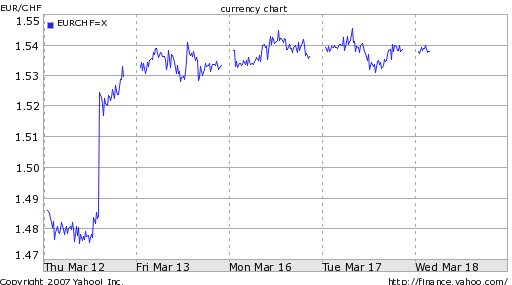 At the same time, the Dollar and Japanese Yen are also considered safe-haven currencies, and as you can see from the chart below, the three have hardly traded in lockstep. In other words, there must be something distinguishing the Franc. Economists point to a strong economy: “Gross domestic product rose 0.9 percent from the first quarter, when it increased 1 percent. ‘The underlying economics of Switzerland are very, very healthy. Concerns about deflation have subsided.’ ” The consensus is that the Swiss economy will expand by close to 2% on the year. However, this is hardly impressive, especially compared to other industrialized countries. In addition, Swiss interest rates remain low, which means the opportunity cost of holding the Franc is high. There must be something else going on. 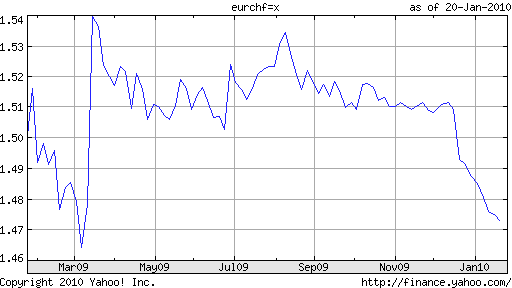 In fact, it looks like the Swiss Franc’s rise is kind of self-fulfilling. For most of 2009, the Swiss National Bank (SNB) spent nearly $200 Billion to artificially hold down the value of the Franc. 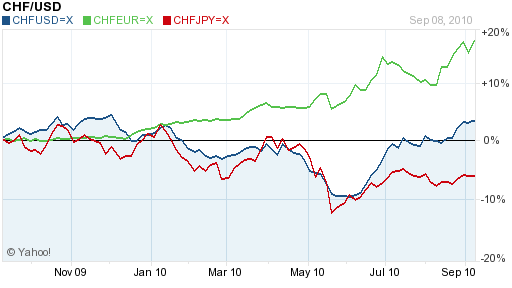 During this period, the Franc remained stable against the Euro and depreciated against the Dollar and Yen. Having finally broken through the “line in the sand” of €1.50, however, the Franc is now appreciating rapidly. Why? Because the SNB no longer has any credibility. It lost $15 Billion (due to the Euro depreciation) trying to defend the Franc, and in hindsight, the mission was a complete waste of time. As a result, a fresh round of intervention is out of the question. 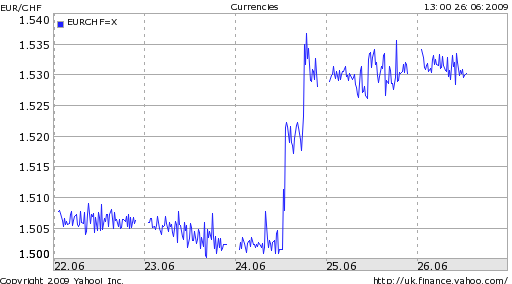 The currency markets have also dismissed the possibility of new intervention, and it seems they are punishing the SNB (via the Franc) for even trying. According to analysts, the markets have also come to see the Franc as a reincarnation of the Deutschmark, due to its “strong economy, massive foreign reserves, traditional haven status and close links with the German economy.” Those that fear a Eurozone collapse and/or want to make exclusive bets on Germany are now using the Franc as a proxy. I don’t personally understand the logic behind this strategy, but where perception is reality, it’s more important to understand that other investors see the connection rather than seeing the connection for oneself. Going forward, there is mixed sentiment surrounding the Franc. One analyst warned clients, “I would be cautious about chasing it too far in the short term. There’s still a huge number of headwinds out there.” According to another analyst, “We expect the franc to remain strong throughout the decade.” Personally, I’m inclined to side with the former point of view. From a fundamental standpoint, there isn’t a whole lot to keep the Franc moving up and its recent surge is probably running on fumes. At the very least, I would expect a correction in the near-term. 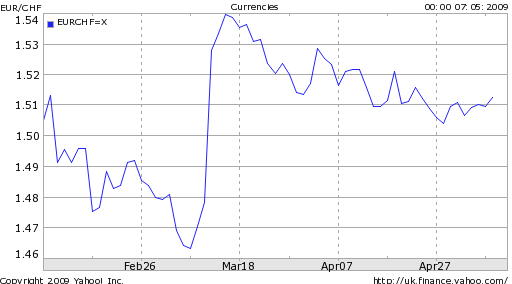 After a brief “hiatus,” the Swiss Franc is once again rising, and is now dangerously close to the $1.50 CHF/EUR “line in the sand” that spurred the last two rounds of Central Bank Intervention. Both from the standpoint of the Swiss National Bank (SNB) the Franc’s appreciation is vexing, while from where ordinary investors are sitting, it’s downright perplexing. That’s because based on the standard litany of factors, the Franc should be falling. The Swiss economy remains mired in its worst recession in 17 years, and is projected to shrink by at least 2% this year. In addition, deflation has already set in, with prices falling at an annualized rate of .8%. To be fair, signs of recovery are emerging, and a plurality of economists believe that growth will return in 2010, as will inflation. But downside economic risks remain, namely the worsening labor market. There is also the fact that the Swiss economy remains heavily weighted towards exports, the demand for which remains slack. From a comparative standpoint, though, projections of recovery are not unique to Switzerland. Financial markets have long since stabilized in most industrialized countries, which many have interpreted as a harbinger for better things to come. On the monetary front, Swiss interest rates remain among the lowest in the world, as the SNB has gradually guided its benchmark lending rate to .25%. It is also in the process of expanding its quantitative easing program, by pumping liquidity directly into the credit markets, in order to mitigate against deflation. In this sense, the SNB is arguably behind the curve. In the US and EU, for example, speculation is already mounting that interest rate hikes will take place as soon as 2010. Economists are less concerned about a shortage of liquidity in those economies, and more nervous about how the potential excess of liquidity can be withdrawn from the financial system before it turns into a problem. Economists in Switzlerland aren’t even close to beginning to have that conversation. According to the SNB, the problem lies in the Swiss Franc, which has remained oddly buoyant. While capital has flowed out of the US, for example, it actually seems to flowing into Switzerland. Members of the SNB have attributed this to the “safe haven,” notion, whereby investors still view the country as a safe haven from the financial turmoil. Perhaps slightly irrational, but real nonetheless. 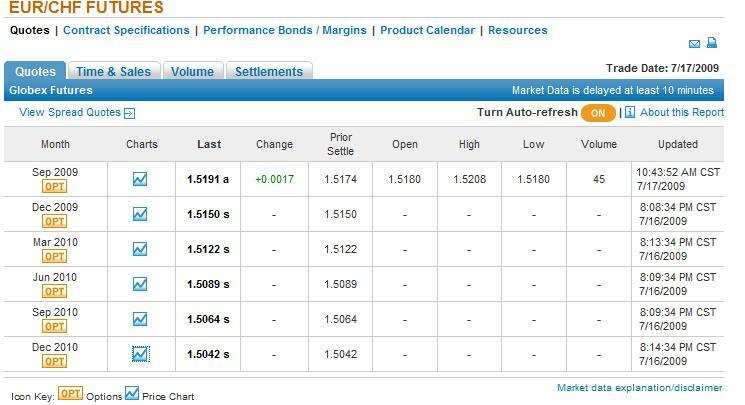 Despite strong rhetoric and equally strong action, the Franc has slowly edge back to the 1.50 mark. Policymakers have pledged to defend the currency vigorously, and it now appears as though another intervention is looming. Given that the SNB has intervened to depress the Franc twice in the last six months, you would think that it would have some credibility with some investors. It seems the lesson is that Central Banks are no match for the markets, and investors realize that ultimately, the SNB is no exception. The Swiss franc and the Japanese yen…were the great beneficiaries during the Crash of ’87, the Debt Crisis of 1998 and again during the current credit crisis, enjoying sweeping and massive upward moves.